This product has been discontinued. While stock last. The Puppy & Kitten grooming products include the Puppy & Kitten shampoo and the Puppy & Kitten conditioner. 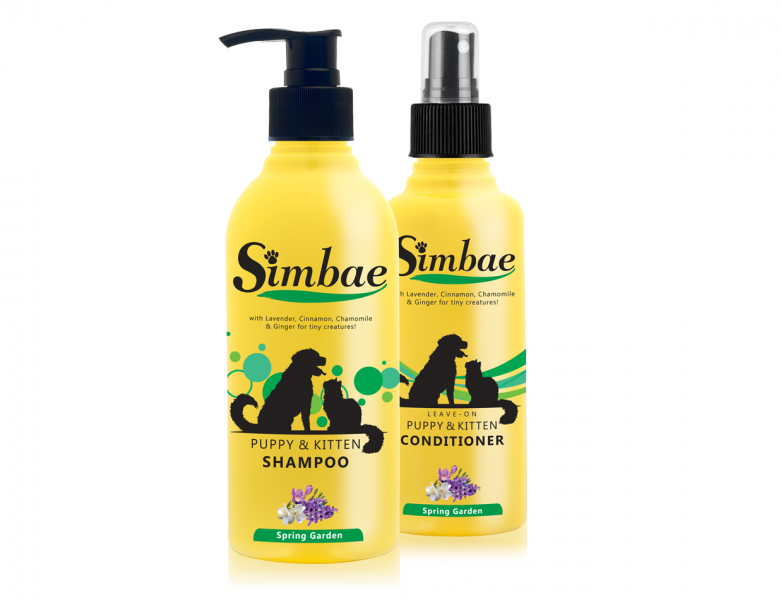 Simbae Puppy & Kitten range uses Lavender, Cinnamon, Chamomile and Ginger to pamper our little creatures with extra comfort and a sense of well-being. Suitable for puppies and kitten from 1-18 months or small dogs and cats that tend to feel frightened during bath times and need calming. Puppy & Kitten Shampoo: Wet the coat thoroughly with warm water and apply a generous amount of shampoo. Massage deeply into the coat from head to tail and rinse well with warm water. Puppy & Kitten Conditioner: Apply to either a wet or dry coat, lightly spray and gently brush through the fur while avoiding face and eye areas. This will extend time between baths and with regular use will bring beautiful natural lustre to any coat.